No matter where you live in the world, litter is most likely a problem around you. Being around in this day and age, we have all seen a fair amount of social media-inspired internet challenges, many which go viral. Many of these challenges range from stupid (cinnamon challenge) to really really stupid (the tide pod challenge). These, in turn, caused a lot of health problems (looking at you tide pod) and caused many to find an excuse to look down at the generations below them. Thankfully, it seems that many have started following this new(ish) challenge that is really beneficial to everyone and everything involved. No matter where you live in the world, litter is most likely a problem around you. Even if not huge in your particular area, most do not go a day without seeing some amount of litter ruining the earth. In fact, about 9 billion tons of garbage ends up in our oceans every year. Thankfully, the newest and one of the most positive challenges of the bunch is called the "Trash Tag" challenge and it's hoping to make our planet a bit cleaner. It apparently started in 2015, but it just recently picks up headway with many people, mainly teens, participating and showing it to the world. Since last week there have been thousands of posts dedicated to this trash tag challenge all over the world. 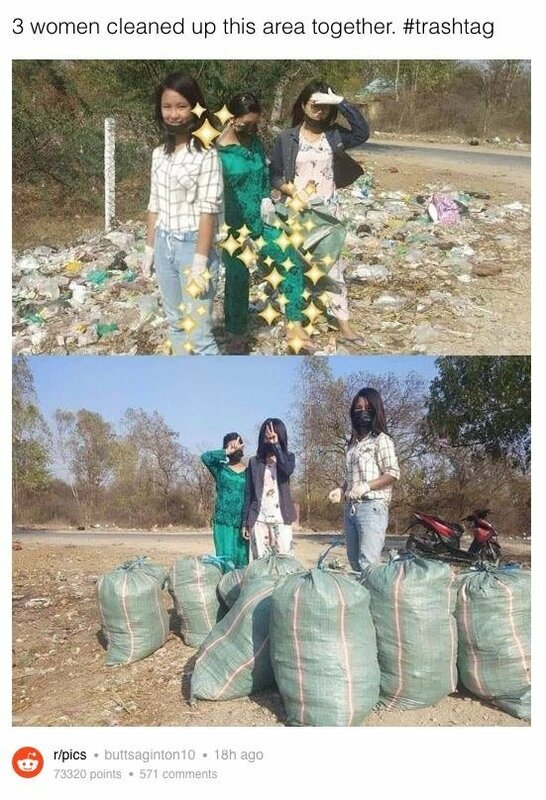 How it works is someone takes a picture of them in an area filled with trash. Some popular and common locations on social media are trash-filled beaches, roads, and patches of forests. Then when the clean up is complete, take a second picture of the litter lacking landscape you made beautiful and clean again. This challenge has had an outpouring of positive responses and has inspired others to clean up our earth. Even if many do it just to do the challenge, or do get the likes, each little bit of cleaning greatly impacts our earth and our garbage problem. The more the challenge takes off and spreads, the better the earth will be. This may be one challenge I participate in.